Surprising no one really, Disney announced that it would be reacquiring the license to produce Star Wars comic books under the Marvel imprint. 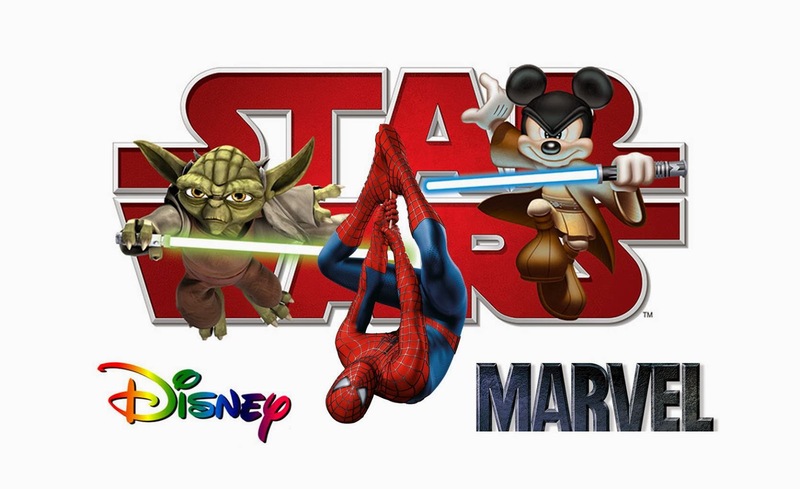 Like Jim Henson's Muppets, The House of Mouse owns both Marvel Comics and George Lucas' Star Wars brands. it wasn't so much a question of if, but of when. After two decades of Star Wars comics published by Dark Horse, Star Wars will be back at Marvel starting in 2015, the year that Star Wars: Episode VII is due in theaters. Dark Horse released a statement on the loss of the license; and Star Wars editor Randy Stradley pointed out that there was a bright side for Dark Horse in losing the license to Disney/Marvel after two decades of producing Star Wars comics. Fan-favorite comic book writer Peter David, creator of the Star Trek: New Frontier series, has been very open about the challenges he faced dealing with Paramount while writing an ongoing monthly Star Trek comic book for DC Comics - in between films. How the process works is pretty simple, a writer is basically bound by the rules and parameters set up by the storyline of the film. David found this quite challenging in coming up with fresh, new storylines, plots and characters. Dark Horse Star Wars editor Stradley acknowledges that along with the much anticipated Episode VII, Disney will also have a new television series. Stradley says that, "it is likely that there will be a lot of comics pages devoted to adaptations and direct spin-off stories in support of the films and TV shows." He admits that he is not interested in that. Star Wars, like Superman, launch an entire genre. In 1938, Superman ushered in an age of super-hero comic books. 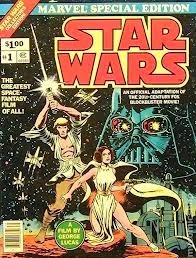 In 1976, Star Wars not only revitalized the science fiction film genre, but rebooted the sci-fi comic book. Flash Gordon may have been a fine film series for Buster Crabbe; but Buck Rogers started out as a newspaper strip, and John Carter of Mars came from the same author as Tarzan, the Ape Man. The sci-fi genre was propped up by films like 2001: A Space Odyssey, Forbidden Planet, Logan's Run; and television series like Star Trek, The Outer Limits, The Twilight Zone, Lost In Space and Logan's Run. Authors like Isaac Asmov, Arthur C. Clarke and Robert Heinlein had given us stars to aspire to. And then, along came George Lucas with his Space Western, Star Wars. 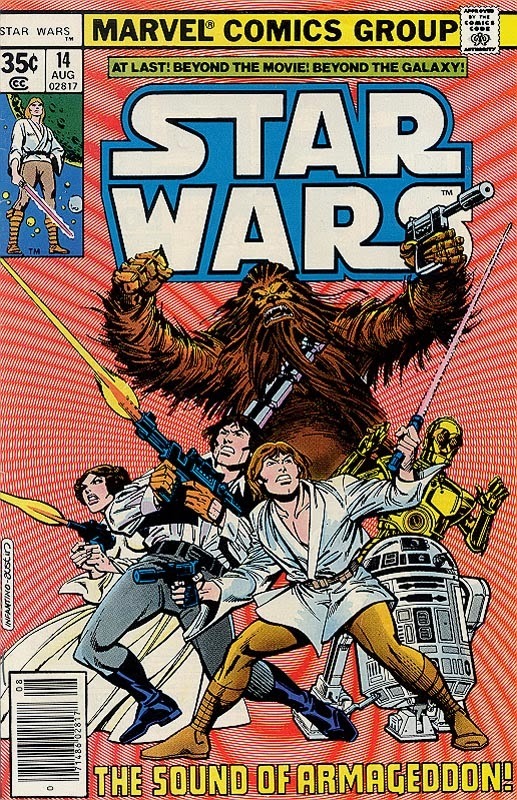 This is what Marvel Star Wars Comics looked like in the late '70's. This, and this. Star Wars was a boom. Marvel's adaptation of Logan's Run only ran for seven issues. Marvel's Star Trek lasted only eighteen issues. Marvel's adaptation of Battlestar Galactica only ran for twenty-three issues. Marvel did a single giant issue tie-in to the Buck Rogers television series, itself a small screen adaptation of the film. Star Wars, at Marvel, last for 107 issues and two years beyond the 1983 release of Return of the Jedi. The comic book lasted longer than any other contemporary science fiction comic book. It lasted two years past "The End" of the first trilogy. 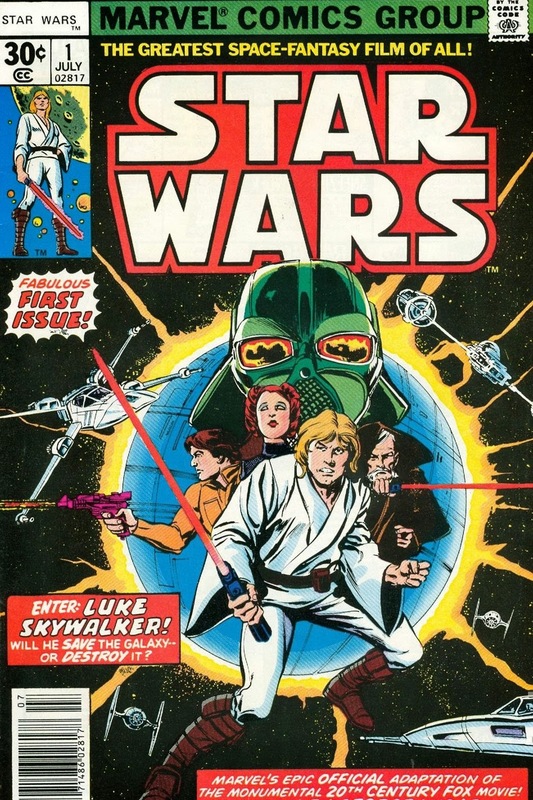 Originally adapting the first film to launch the title, Marvel opted to adapt The Empire Strikes Back in the pages of Star Wars, but spun off Return of the Jedi as a four-issue mini-series apart from the main book. The challenges that face any writer involved with a property like Star Wars, or any film adaptation, is that primarily the writer is playing with someone else's toys. Second a writer's boundaries and parameters are very narrow. With Star Wars the only film out, at a time before the internet, or home video for that matter, the question of Where to go from here? is not as big and wide open as one might think. Considering that a writer is working almost parallel and at cross-purposes to a screenwriter and franchise development. Peter David has shared a number of horror stories of his dealings with Paramount of what ground he could cover as a Star Trek writer. Stradley admits that 2015 is going to be a great year to be a fan - a new fan - of Star Wars; with a new film franchise launching, a new television series starting, and new tie-in comics coming from Marvel comics. 2015 is going to be a great "jumping on point" for new fans. This was my Star Wars. By Carmine Infantino. He was involved in creating one of the most popular characters in comics. Police Scientist Barry Allen, who became The Flash. In the late '70's. From Marvel. 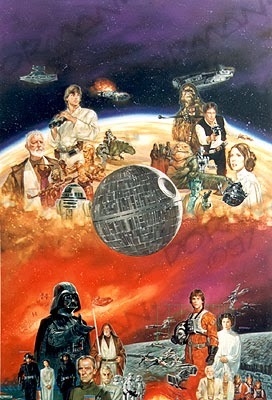 This is my Star Wars re-imagined years later at Dark Horse Comics by Dave Dorman. Hopefully, the writing and art of new Star Wars comics at Marvel will reflect the high production values that fans will enjoy in the new Disney films and television series. Hi! I'm Dave. I read comic books. I like going to the movies. When I can, I like watching NCIS. I'm a new dad. I have two boys; Ethan (12) and Justin (11). My wife and I have been on an incredible journey to become parents. Right now we are in the process of adopting our third child a daughter. My boys don't have any interest in comic books, which is fine by me. They love sports; soccer, basketball and baseball. They like video games. I used to have a very wide interest in comic books; but now, I've drawn a line in the sand at 1985. With very few and rare exceptions, my interest in comics is from the time I started reading them, around 1974 through 1985. Who doesn't love Golden Age comics or characters? Who isn't a fan of the Silver Age? A lot of cool stories were told in the '70's and early '80's. Crisis on Infinite Earths and Secret Wars changed the definition of "fun" in comics forever.